Auburn faculty and students call the Plains home. They spend time in the same hallowed halls and walk the same campus pathways, giving cheerful greetings as they pass. But a few Auburn faculty are participating in a program that provides a more personal, mentoring role. From encouragement in the classroom to engagement in the residence halls, the Faculty-In-Residence program supports student achievement and academic growth on Auburn University's campus. 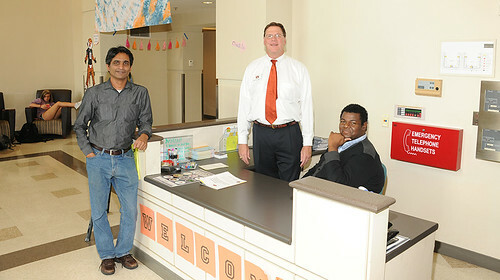 Auburn's Faculty-In-Residence, or FIR, program began in fall 2009 when the Village residence halls opened. Although FIRs live in Village residence halls, they are available to residential students across campus. 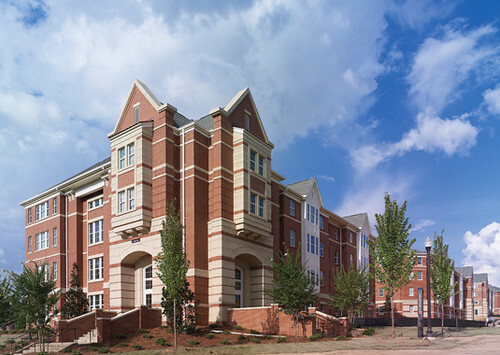 Each Faculty-In-Residence is an Auburn faculty member who lives in a residence hall and interacts informally with the residents of that hall. FIRs attend and host programs for students with the help of resident assistants – undergraduates that work for Residence Life to support and monitor student residential activities. 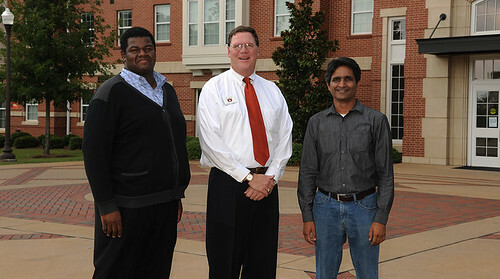 The Faculty-in-Residence members for the 2015-2016 academic year are Paul Harris, associate director for national prestigious scholarships in the Honors College and professor in the Department of Political Science; Ameya Kolakar, instructor in the Physics Department; and Ken Thomas, honors lecturer in biosystems engineering in the Honors College and the Department of Biosystems Engineering. Director of Residence Life Virginia Koch works directly with the FIRs to create a mutually beneficial relationship between residents and faculty. "One goal for the FIR program is that students come to know faculty as 'real people' and develop mentoring relationships that will encourage them to reach out to other faculty," Koch said. "For faculty, we hope that they will gain an appreciation for student life outside the classroom and engage students in educationally purposeful activities, which promote intellectual curiosity." Harris has been a Faculty-in-Residence for five years, living in Aubie Hall. During his time as a FIR, he has planned events with the resident assistants including cultural evenings and documentary screenings with multicultural organizations, taught honors seminars in the Village and assisted students in applying for national prestigious scholarships. "Being a Faculty-In-Residence helps me connect with the students on their time," Harris said. "It's been a big benefit because I am able to get to know students after hours and provide good career and academic scholarly advice. I am not here necessarily to enforce the rules, but to provide out-of-class support for my students." Marian Royston, a former student of Harris' and resident assistant in Aubie Hall, has known Harris since the fall of 2010 when he began his FIR experience. "My college experience definitely benefited from living and working with a faculty member," Royston said. She credits Harris with encouraging her to apply to be a member of the Honors College and also for national scholarships, including the George Mitchell Scholarship. "Having close interactions with Paul allowed us to get to know one another in a much more natural atmosphere," Royston said. "He was able to be a better mentor to me because we knew one another as human beings rather than student and teacher. I knew him as 'Paul' before I ever entered his office in Cater Hall to visit 'Dr. Harris.'" "I think becoming a Faculty-In-Residence is a wonderful opportunity to have a stronger connection with our students," Harris said. "We talk about the Auburn family, and I think this is consistent with that ideal. We want to provide students with a safe living environment and an environment where they can speak to us." Although Kolakar and Thomas began their FIR experiences this fall, both had already shown a passion for student engagement outside the classroom. Kolakar organized a Big Tent Event April 29-30, which is an example of the type of programming he might plan as a Faculty-In-Residence. The event was a combined effort between the physics, chemistry and biology departments, with help from the Biggio Center, Office of Information Technology, the Office of the President and the Art Department. He has organized study sessions before, but the previous events were held inside. When more than 100 people began attending, the momentum was strong for the session to expand. Students were encouraged to attend the event for exam practice. 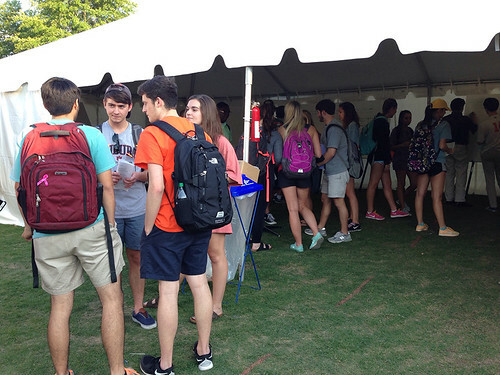 Upon arrival, students congregated under the physics, chemistry or biology tents and received a set of problems. Large whiteboards, popcorn and coffee were made available as the students worked. "There is no tangible incentive, like extra credit, for this event," Kolakar said. "Students are here to work as a group, to find answers for themselves and to build confidence in their abilities. I call this taking ownership of learning." Kolakar says that he is passionate about student learning and he believes that events like this give students the encouragement and self-assurance they need to succeed. "Physics is a subject students usually hate," he said. "Most of them have never seen it before, so they literally fear it. At an event like this they are working together as a group and are getting exciting about solving the problems." As a Faculty-In-Residence Kolakar hopes to have more events with an enjoyable, stimulating atmosphere. For example, he wants to hold a once-a-month movie night, showing a film with an inaccurate depiction of science. Afterward he'll host an "ask a physicist" booth so the students will learn through entertainment. Thomas was inspired to join the program by working with Harris in the Honors College, and is excited about his FIR experience. "I am very much looking forward to interacting with students more informally while being there for them in a place that we will live together," Thomas said. "I think that this position presents a unique challenge for faculty members – one that can certainly push us to become better classroom teachers after having more personal, day-to-day interactions with students." Through personal and group interactions with students and hall staff, FIRs encourage a welcoming, safe and inclusive living environment. The Faculty-In-Residence program supports the social and intellectual development of residents by promoting effective learning habits, engaging with students in educationally purposeful activities and encouraging intellectual curiosity. Each Faculty-In-Residence serves as a positive role model, academic mentor and resource to residents and hall staff. For more information about the 2015-2016 Faculty in Residence, go to http://www.auburn.edu/residencelife/staff/FIR/.